Facebook CEO Mark Zuckerberg was scheduled to testify before the US Congress twice this week in response to last month’s Cambridge Analytica data fiasco and is without question the largest scandal the social giant has ever faced. Today's hearing was before the Senate Committee on the Judiciary and Senate Committee on Commerce, Science, and Transportation, while tomorrow he's expected to testify in front of the Committee on Energy and Commerce (watch the livestream here). This was the first time Facebook’s founder testified before Congress, somewhat reminding us of the late 1990s when then technology industry's poster child, Bill Gates was put in the hot seat, trying to defend Microsoft's business practices. It was an interesting exchange. Senators tried to grill Zuck, but he seemed better prepared than the 44 U.S. Senators that questioned him. 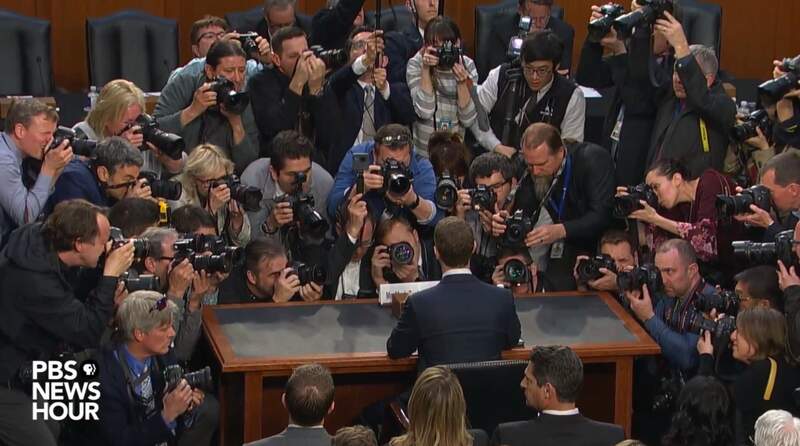 For the most part, Zuckerberg came out unharmed from the five hour long testimony. Senator Hatch: Now, Mr. Zuckerberg, I remember well your first visit to Capitol Hill back in 2010. You said back then that Facebook would always be free. Is that still your objective? Zuckerberg: Senator, yes. There will always be a version of Facebook that is free. We’re committed to doing that. Senator Hatch: Well, if so, how do you sustain a business model in which users don’t pay for your service? Zuckerbot: Senator, we run ads. When questioned about Facebook being a monopoly, he avoided mentioning competitors, although Whatsapp and Instagram (both owned by Facebook) were mentioned more than once. Senator Graham: Who’s your biggest? Let me put it this way. If I buy a Ford, and it doesn’t work well and I don’t like it, I can buy a Chevy. If I’m upset with Facebook, what’s the equivalent product that I can go sign up for? ... Is there an alternative to Facebook in the private sector? Senator Graham: Which is the same service you provide? Senator Graham: Is Twitter the same as what you do? Ultimately, Zuckerberg was able to handle all questions and perhaps his appearance was softened by the fact that over the past few weeks there have been numerous announcements on Facebook's part to show that they are committed to fight data leaks and do better. - Breach of trust; sorry we let it happen; took steps in 2014 to stop it happening again. - Quiz app designed by Cambridge University researcher named Aleksandr Kogan. - People who used app gave Kogan FB information like public profile, page likes, friend list + birthday; same for friends’ whose settings allowed sharing; NO credit card/SSN info. - Kogan sold to CA in violation of our terms; when we found out, told them to delete data. - Confirmed they had — now seems untrue. Should have done more to audit + tell people. - Didn’t think enough about abuse; rethinking every part of our relationship with people. - Important issue but no credit card information or SSN shared. - People gave Kogan access to Facebook information like their public profile, page likes, friend list, birthday; same for friends’ whose settings allowed sharing. - 2014 changes mean it couldn’t happen now; restricted apps’ access to data even further. - Found out about abuse two weeks ago, shut it down. - Useful to find someone by phone number/email; if people have the same name. - Malicious actors linked public info (name, profile photo, gender, user ID) to phone numbers they already had; shut it down. Need to do more to prevent abuse. - Fire people for CA? : It’s about how we designed the platform. That was my responsibility. Not going to throw people under the bus. - Do you ever fire anyone? : Yes; hold people accountable all the time; not going to go into specifics. - Resign? : Founded Facebook. My decisions. I made mistakes. Big challenge, but we’ve solved problems before, going to solve this one. Already taking action. - No accountability for MZ? : Accountable to you, to employees, to people who use FB. - I use FB every day, so does my family, invest a lot in security. - Made mistakes, working hard to fix them. - Giving people more controls, just yesterday stated showing people their app controls. - Want FB to be a service that everyone can use, has to be free, can only do that with ads. - Key for me is mission — helping people connect. Business model supports that mission. - Let’s be clear: Facebook doesn’t sell data. You own your information. We give you controls. - People know [...] need ads; tell us if they have to see ads, want them to be relevant. - Facebook [...] not time spent; time spent fell 5% Q4; pivot to MSI. - [...]ssesm[..] to communicate with kids; MK gives parents control. - [...] like N[...] have commercial ads. We have no plans to do so. - Billions people globally use FB every day to connect to the people that matter. - Families reconnected, people met and gotten married, movements organized, tens of millions of SMBs now have better tools to grow and create jobs. - More work to do, but can’t lose sight of all the ways people are using FB for good. - At FB, we try hard to charge you less. In fact, we’re free. - [On data, we’re similar. When you install an app on your iPhone, you give it access to some information, just like when you login with FB. - Lots of stories about apps misusing Apple data, never seen Apple notify people. - It’s very disturbing; and sadly we do see bad things on Facebook. - Should have no place on our service; community standards prohibit hate, bullying, terror. - Working to be more proactive; AI, hiring more people e.g. terror, e.g. suicide. - Will never be perfect; but making huge investments. - Too slow, making progress. France, Germany, Alabama. - Midterms are important, but not just in the US — Brazil, Mexico, Hungary. - Just announced committee of academics to commission independent research on social media on democracy. - Silicon valley has a problem, and Facebook is part of the problem. - Personally care about making progress; long way to go [3% African American, 5% Hispanics]. - Small part of ad market: advertisers have choices too — $650 billion market, we have 6%. - Break up FB? : US tech companies key asset for America, break up strengthens Chinese companies. - People deserve good privacy tools and controls wherever they live. - Provides control over data use — what we’ve done for a few years. - Requires consent — done a little bit, now doing more in Europe and around the world. - Get special consent for sensitive things e.g. facial recognition. - Support privacy legislation that is practical, puts people in control and allows for innovation.